Kick off bike month with a weekend of special offers and discounts at local shops for people who bike around Cleveland Heights May 3-5th. For more information, download the flyer HERE. Am I supposed to ride in the middle of the lane or near the curb? How do I signal a turn? Am I allowed to ride on the sidewalk? In celebration of Bike Month, join uGO University Circle, University Circle Inc., and Bike Cleveland for an introductory cycling class at the Cleveland Museum of Natural History from 5:00 - 6:30 p.m. in the downstairs Classroom B. After the class, participants are encouraged to participate in the Slow Roll community bike ride departing from Wade Oval at 7:00 p.m. Food will be provided prior to Slow Roll. Registration for the Bike 101 Education Class is required and will be limited to the first 20 participants. REGISTER HERE. Join Slow Roll Cleveland for a leisurely group ride. Meet at Wade Oval Park at 6:30pm. The ride begins at 7:00pm. There is a UHBikes bike share station on Wade Oval in front of The Cleveland Museum of Art. Parking is available in nearby garages at The Cleveland Museum of Art, Cleveland Museum of Natural History and the Botanical Gardens. On-street parking is available on Wade Oval Drive and East Boulevard. For more information about Slow Roll events throughout the summer, visit Slow Roll Cleveland. Whether you're a regular bike commuter or just getting started, ride by the uGO table on Euclid Avenue at East Boulevard (in front of Severance Hall) for free coffee and breakfast snacks from 7:00 - 9:00 a.m. The table is sponsored by uGO with support from University Circle's Sustainable Transportation Advisory Committee. For more info about local bike month events, check out Bike Cleveland's event page. Join uGO, Bike Cleveland and NOACA for a 30-day bike challenge throughout the month of May! Log your bike trips on Gohio Commute for the chance to win weekly raffles for gift cards to local bike shops and grand prizes for highest overall number of bike trips logged. 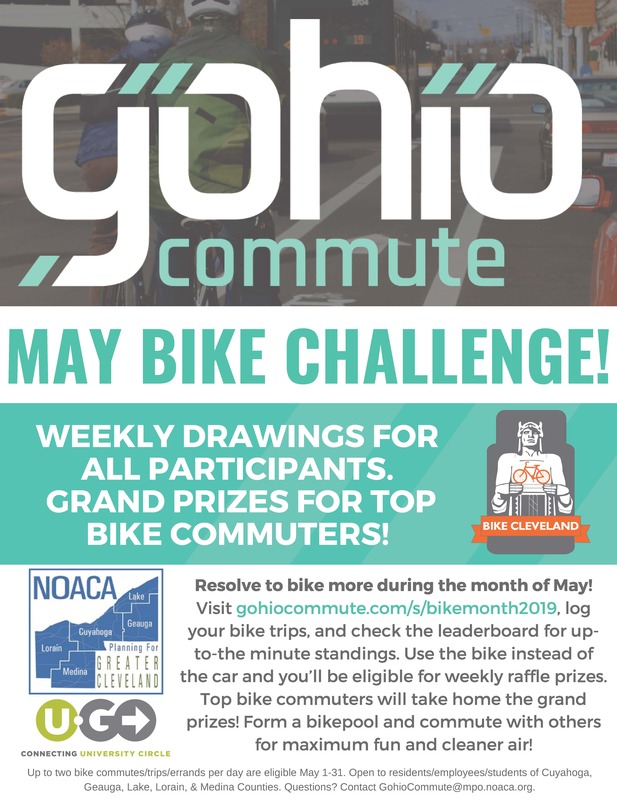 To participate, register on Gohio Commute, log your bike trips during May (you can link your account to Strava or Commute Tracker for automatic logging), and follow the leaderboard for up-to-the minute standings. Up to two bike trips per day will count toward your standings. This challenge is open to residents/employees/students in Cuyahoga, Geauga, Lake, Lorain, & Medina Counties. Print a flyer here. If you have additional questions about Gohio Commute or need technical assistance, please contact GohioCommute@mpo.noaca.org for more information.